I decided to participate in the blog week again this year. Today’s topic has mulled around in my head, and the only thing that I can think of to talk about are sock yarns. I tend to gravitate towards finer gauge yarns, and lately sock yarns for a lot of my projects. My tried and true time-tested favorite sock yarn is Jawoll by Lang. 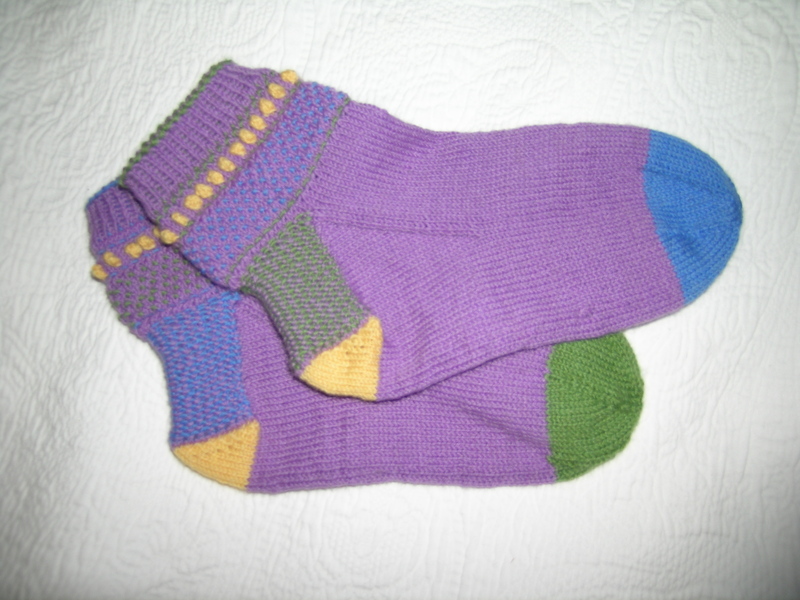 This was one of the first sock yarns that I knit with about 15 years ago, has been around for years, and I have quite a stash of it in my yarn cabinet. When I was putting away a bunch of hand knit socks that I had washed over the weekend, for both myself and my husband, the socks that have worn the best, held their shape the best, and are the most versatile were made with this yarn. A few years ago I was trying to convince my LYS to stock sock yarns. The answer that I got was that “none of our patrons knit socks”. I retaliated that the sock knitters did not come to their shop because they did not carry sock yarns. So, I ordered a vast array of colors of Jawoll in the mail. Soon after it arrived, the same LYS tried to get me to come in and look at all of their new sock yarns, and wasn’t it so much fun to knit socks (amazing what happens once you drink the water). I said that I was set for quite a while. This sock yarn also comes with a matching spool of reinforcing thread inside each skein for the toes and heels (toes especially for my husband). Varying colors and tweeds are available, but definitely with a machine-made look to them. the gauge is fine enough to allow for colorwork or cabling and not have it be too thick. It has handled the test of being my husbands favorite socks that he wears to work all winter long, and only 1 pair have had to have toe replacement. So, a few years ago, I was wanting to try some more of the hand dyed sock yarns from the companies out there. 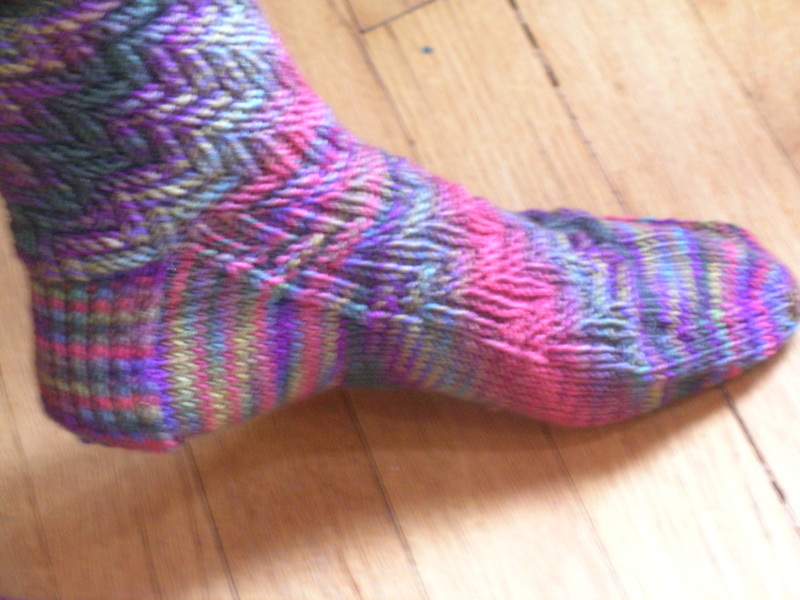 I joined the Socks That Rock sock club for 2 years, and made 12 pairs of socks with their yarns. The colors are gorgeous, apart from my dissatisfaction with the patterns was the fact that the yarn itself was thicker than I preferred, and very tough to work with. 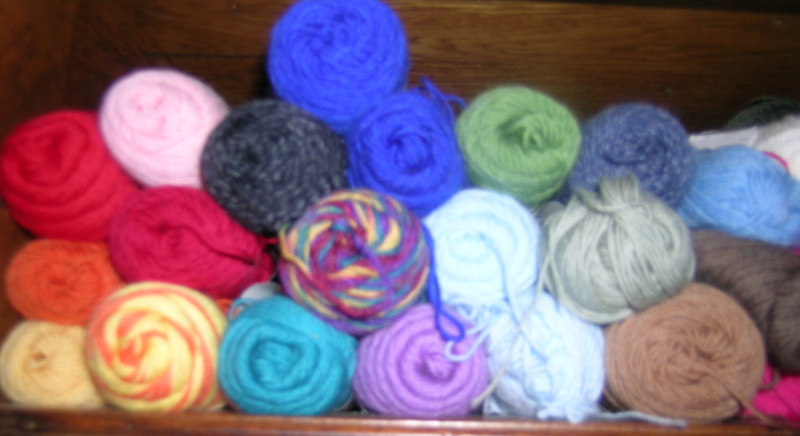 I often felt like I was knitting with cotton instead of wool. I have given most of those away, but kept a couple for myself. 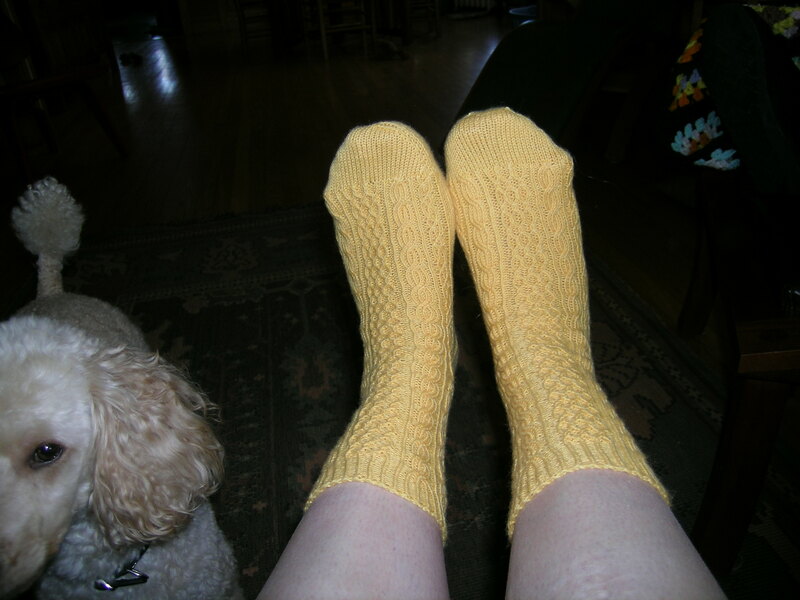 I have not had wearability issues with the yarn, but they remain house socks, as they do not fit into any of my shoes (unlike the pairs above), and they have not faded like I have heard others complain (and I even dry all of my socks on the line in the summer). 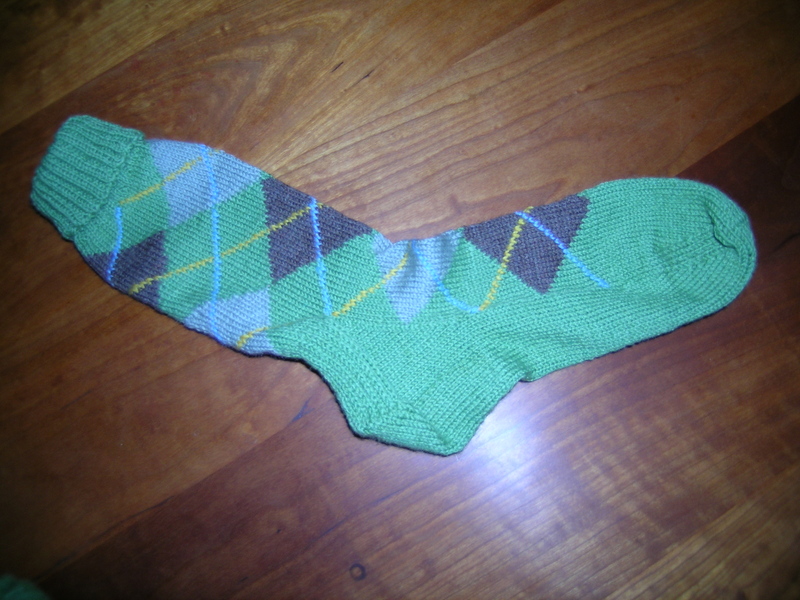 However, they do not seem to be holding their shape, and have become rather floppy socks. 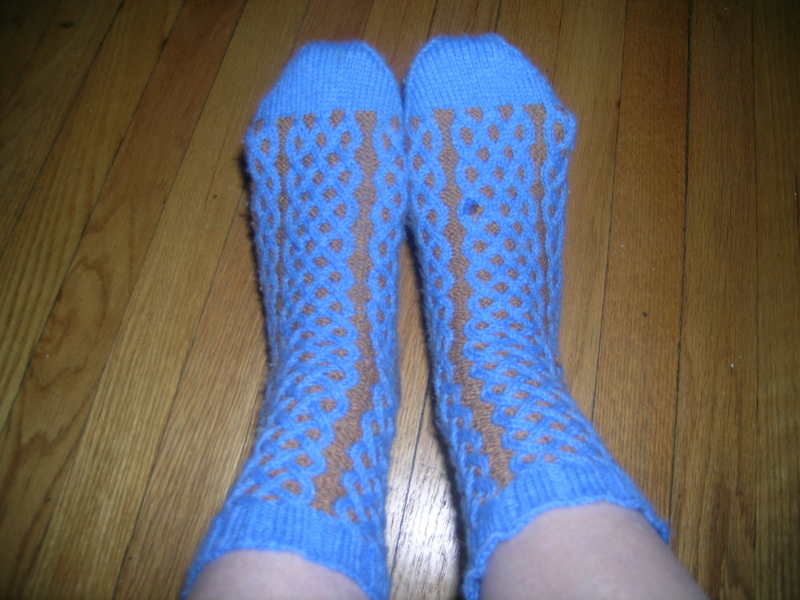 Now I am in 2 sock clubs, and get yarn and patterns for both together every other month. This is a more interesting experiment, as the patterns are more intricate, and the yarn is from a different Indy dyer each time. That way, perhaps I can find that perfect balance of fineness, and color options. In the meantime, I have a lot of the Jawoll to knit from, and still 2 skeins of the coveted Woolmeise sock yarn. Thanks for the Jawoll recommendation. I’d like to slowly build my sock yarn stash with quality yarns and it’s hard to know how some of the newer indie dyer yarns will hold up over time. How does Jawoll compare to Opal? I like Jawoll the best personally, and the fact that I can get loads of solids. I am looking for that great Indy dyer that has the light weight, and wearability. I am hoping my sock clubs will lead me in the correct direction. Also, I recently purchased 2 skeins of Jawoll Magic, and did NOT like that yarn at all, very splity. I am hoping that they have not changed the original.